I recently had a work gig on the far east-side of Mid-Town, a neighborhood I thankfully rarely have to go to, and on the way I was lucky enough to stumble upon Nishida Sho-Ten. The food there was so good, I went back for second dinner after my gig was over. Nishida Sho-Ten has a retro-look, designed to look like a Japanese ramen joint from the early post-war period, although the bathroom has one of those super hi-tech Japanese toilets that comes with its own operating system and control panel. All of the available ramen broths are made with chicken stock, which I don’t eat, but the rice ball stuffed with roast pork was sublimely delicious. The individual serving size Okonomiyaki came served in a sizzling hot, cast-iron pan and was amazing. Nishida Sho-Ten is part of the Ramen Joe mini-chain of ramen joints, which I am going to have to thoroughly explore. The Dumplings: The pan-fried pork gyoza are home-made and filled with juicy, well seasoned pork and lots of chopped scallions (or maybe chives). 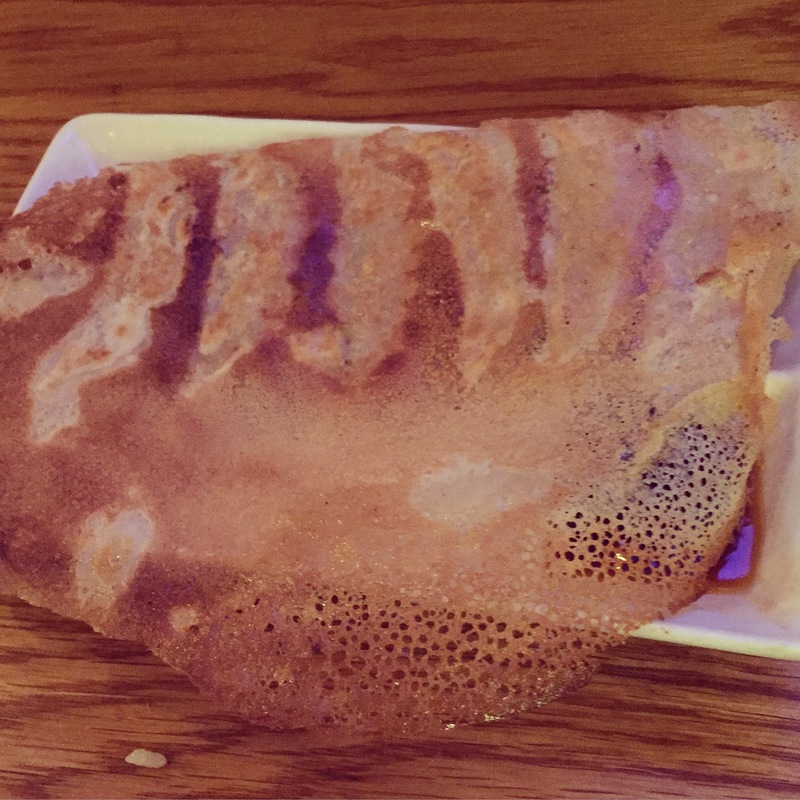 They are served embedded in a crepe-like layer of crispy fried batter, a dumpling style you don’t see very often (Dumpling House in Toronto does these really well). 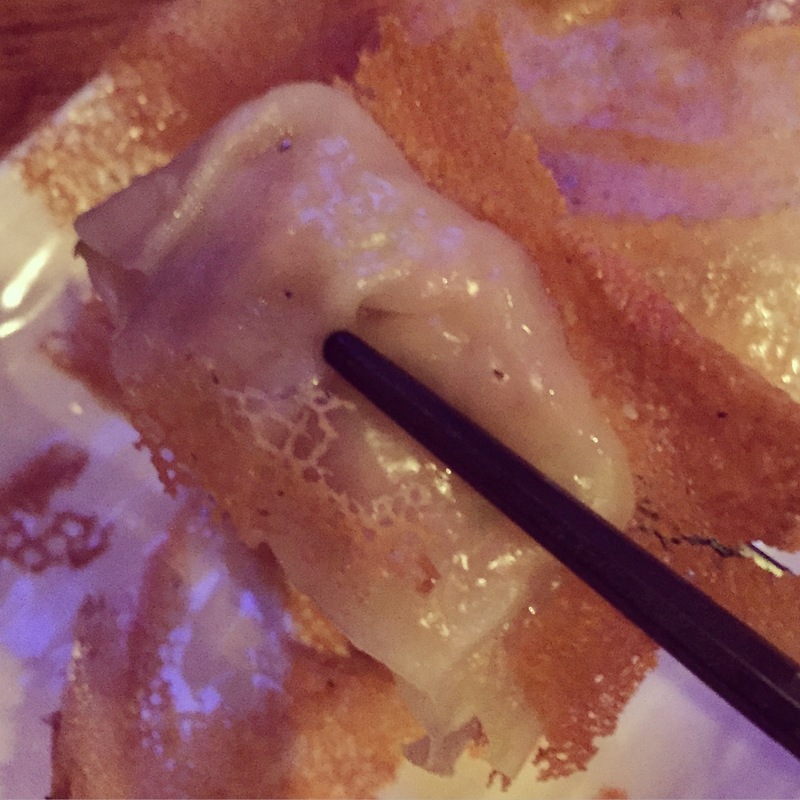 The crispy batter added a great crunch texture to these dumplings. These dumplings were so good I had them for first and second dinner. As part of second dinner I also tried the Takoyaki, which were also fantastic. They were perfectly cooked so the outside was crispy, while the batter inside was creamy and the pieces of octopus in the center were tender. They use a really good sweet and tangy Worcestershire style Tako-sauce that worked well with the briny bonito shreds and the Kewpie mayonnaise. The Dipping Sauce: The serving plate for the gyoza had two little built-in dipping sauce bowls, one of which was filled with a soy based dipping sauce and other with chili oil. The dipping sauce was flavored with a lot of rice vinegar and some sesame oil and was a good accompaniment to dumplings. Unfortunately the dipping bowls are more like dimples and it was hard actually dunk the dumplings in the sauce. 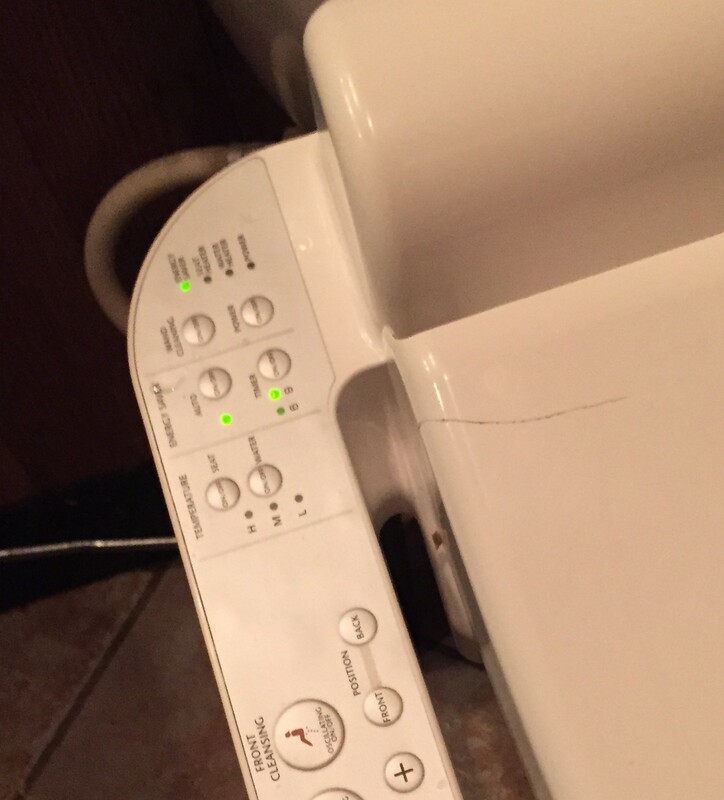 The control panel for the hi-tech toilet. The Location: Nishida Sho-Ten is on 49th Street between First and Second avenues near the UN Plaza. The neighborhood is kind of a pain to get to and there is not much else out there, but dinner at Nishida Sho-Ten is worth the walk. Several of the other restaurants in the Ramen Joe chain are more conveniently located, hopefully they prove to be equally good. 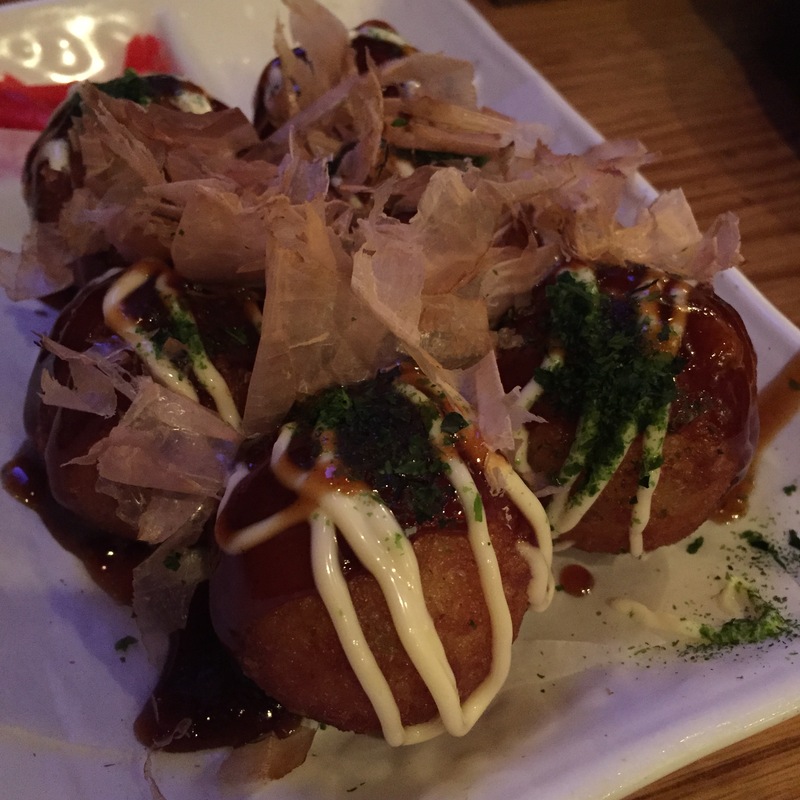 This entry was posted in Gyoza, Japanese, Takoyaki. Bookmark the permalink.